Running into a dog off-leash in a public place where leash laws are in effect is one of the things that irks me the most. When I decided to finally write this post, I knew I’d have to take some breaks, breathe deeply, and just keep my cool. For those of you who allow your dog off leash in public places that have leash laws (I’m not talking about zoned off-leash dog parks and dog beaches), shame on you! You heard me. I am so disappointed that you think you and your dog are above the law and put your needs above others. Here are a few things to consider before unsnapping your dog’s leash in public. Not all humans feel comfortable with all breeds. Not all dogs enjoy unfamiliar dogs invading their space. Dogs with an injury, seniors, dogs healing from surgery or illness can be sensitive about their space. Dog parents may be working on behavior skills for their dogs such as ignoring other dogs. Service dogs are not to say hello to dogs while working. Not all service dogs are identified by vests. Not all dogs are friendly with all dogs. If you are in a public space, likely you have a leash law. That leash law is probably a 5′ or 6′ leash. Personally, I have been in more than one of the above scenarios, and know dogs and their humans who have experienced the others. The sad truth is a lot can go wrong in a blink of an eye. I know many people who have been the victims of off-leash dog fights. Their dogs being the ones leashed and injured, some severely. I, too, have come across my share of off-leash dogs in public settings and luckily to this day have avoided fights with a few tools I will address in this post. Hopefully, these tools will help you if you find yourself in this unfortunate situation. First, I want to just confirm I love dogs. I adore them and have made a career working with them and rescuing them. However, my family, which includes my dog, comes first. I have the right and an obligation to protect my family. Period. End of story. Second, I’m proactive. In this situation that would mean I’m not going to wait and see if a dog is going to injure, frighten, or in any other way make contact with my dog. My current dog Dexter is very appropriate, friendly, and social. But he does not like to be jumped on or wrestled with, and can easily be injured. As I start to list some ideas to keep your dog safe, it is important to know that nothing is 100%. Not every idea will work for every dog in every situation. These are not listed in any particular order; it truly depends on your personal situation, where you are, how fast the approaching dog is coming, etc. Sometimes you can make things worse. Unfortunately, that’s just the nature of the beast. The only 100% solution is for pet parents to keep their dog leashed, prevent them from escaping their yards and homes and not to release dogs into the wild to become strays and have puppies! If the approaching dog’s human is nearby, holler, “My dog is contagious and aggressive!” While you are saying that, continue to swiftly move in the opposite direction with your dog. Teach a very reliable Sit/Stay. 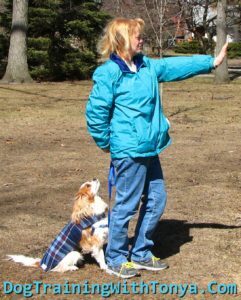 Work with your dog over the course of his life to teaching a Sit/Stay in various distractions and environments. With an approaching off-leash dog, ask your dog to “Sit/Stay” behind you, calmly walk towards the approaching dog and throw a fist full of dog treats at the dog’s head. Yes, you want them to land on the dog’s head so it startles him a second. Then hopefully he will start to eat those treats and as he does, toss another handful over his head towards the direction he was coming from. 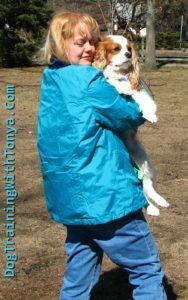 Retreat calmly but swiftly with your dog. Hopefully, the irresponsible owner will be able to collect his dog as you make your escape. Play traffic cop. 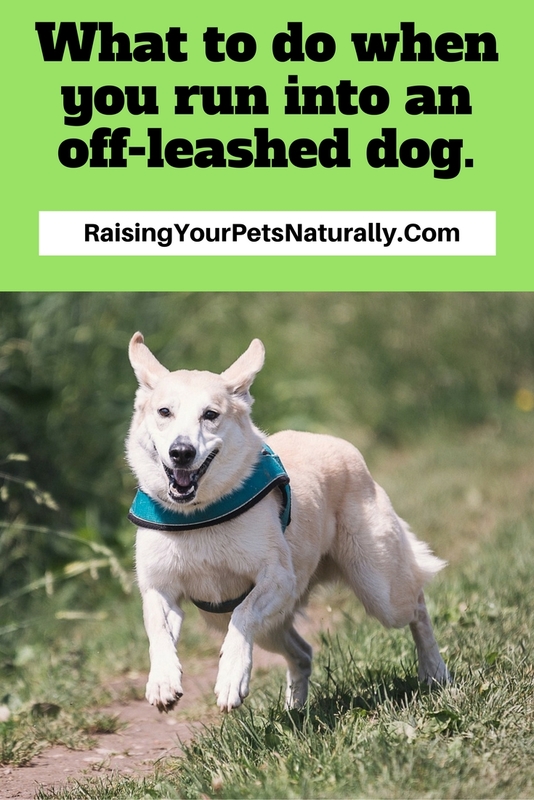 As soon as the approaching dog comes towards you, face off with the dog and hold your dog’s leash behind you so you are in the middle of the approaching dog and your dog. 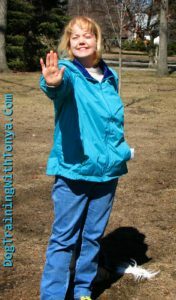 As you do this raise your hand straight out like a traffic cop stopping traffic. Yell, “Stop! Go Home!” Repeat if the dog startles and seems to be listening. At this same time, you are walking backward with your dog, still holding your cop hand out. Keep telling him to go home. If the loose dog is sort of listening, but still lingering a bit, I get a bit louder. Air horn. This has been one of my favorites over the past few years. Now, it’s extremely important to condition your dog that this noise is a good thing and not scary. If your dog is easily startled or unsure of certain noises, do not do this. Very similar to the traffic cop in #3, present your body the same, but this time adding the horn. Umbrella. This like the air horn in #4, you want to make sure your dog is comfortable with the umbrella. As the dog is approaching face, the umbrella towards him and quickly and loudly pop it open. If needed, you can shake the popped up umbrella towards the dog as you yell or tell him to go home. The unopened umbrella can double as a stick if you end up in a fight, and you actually need to hit the other dog to have him release your dog. Direct Stop, Spray Shield, Pepper Spray, Bear Spray or a Taser Gun. These tools are probably the ones that can be iffy in situations. One of the biggest downsides is that your dog and you are likely to also have its wrath if sprayed. Bear spray does seem to have a better aim. However, if the approaching dog does start to attack your dog, it may be your only option. Picking your dog up. If you have a smaller dog, this can be a good option if your other attempts atbacking off the loose dog are failing. But it is important to note, that a dog being held in the air can be more arousing to the other dog, who could jump on you and knock you both down. This could be a very scary and possibly life threatening situation. So exercise extreme caution if attempting this move. If at all possible, place your dog INSIDE something the oncoming dog cannot get at such as a pickup truck bed, roof of a car, garbage can, or throwing them over a fenced yard. The unthinkable. When nothing works, and you or your dog are being attacked, you will need to try to defend yourself. My hope is that you will have some kind of tool on you (umbrella, stick, or spray). You are going to want to cause as much injury as you can to the other dog. Try hard to be able to get the back legs and swing low and hard away from you. If you cannot reach the back legs, try to hit the dog as hard as you can on his head, eyes, or mouth. The unthinkable is truly a scary situation, and I hope you never have to be in that position. If you are able to break them apart, it is important to try to secure the other dog to something or he will likely come back for another attack. I know this sounds so scary, but unfortunately, things like this do happen. Please be careful when you are out walking your dog. Stay in populated locations so that if the unthinkable happens you will not be alone. 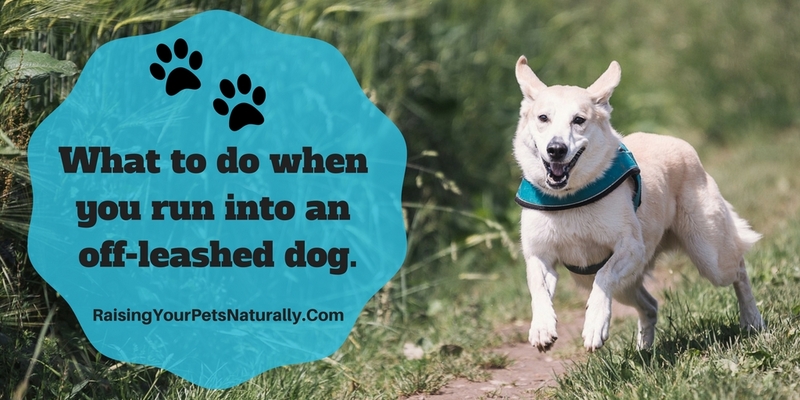 If you have a neighborhood dog who runs off leash at large, don’t be shy about your concerns. Contact your homeowner’s association, local police, and animal control. Take photos of the off-leash dog for evidence and keep a log book. It is your right to have a carefree walk with your dog. So stay safe, be proactive, and be confident. You got this. Have you been in this situation? I’d love to hear how you managed to keep safe. Tell me in the comments. I disagree with causing damage to the other dog because it might make things worse…I’ve heard to grab back legs and pull them off the ground if you can (the other dog will be contained because there isn’t any strength to push off from with front legs only); Use a hose or fire extinguisher to surprise and separate the dogs; break the line of sight if possible (get you and your dog on the other side of a bush or car); yell “Leave it” because it’s an important command that should be taught to both your dog and any other dogs. I’ve seen Leave it used quite successfully. I’ve also used it in an uncertain situation; and the other dog looked startled at me and then ran home. Thanks, Lisa. Yes, you never know when something will make things worse. There is never a right answer. Unfortunately, I’ve personally known a handful of people with their dogs that had no other choice to try to cause harm to the other dog that would not stop the attack. It can be a very scary situation. I got severely bitten by an English bulldog at the large boarding kennel I was General Manager at. The dog had boarded with us frequently and was never a problem. He had been to the vet the owner brought him into the lobby, we put him behind the counter and as I was talking to a client he turned and grabbed onto my left ankle with his teeth and would not let go. The only way a client got him to release was to grab his collar and turn until he choked and had to let go. I ended up with 30 stitches, it then got infected, in the hospital for surgery, wound pump on for 3 months and one hell of a scar. The owner put the dog down and come to find out the dog had been acting aggressive to his children. He really should have addressed that issue with his vet. Wow! I am so glad you were “ok” and the kids too. That is so scary. Thank you for sharing. If a car is nearby, I have often thought it might scare the dog off if you make the car alarm go off. Bumping the car or trying to open the door usually does it. It not only might scare the dog away but alert others you need help. That’s a great tip Cozette! Thanks for sharing. Thanks for this info. Just not sure how these tips would work while walking multiple dogs. Thanks. Yes, a bit of a dilemma. For safety alone, I would go with another human or fewer dogs. I know, I know. But, totally scary if a lot of dogs are involved and only one human is there. One tip I really don’t like the recommendation to say “My dog is contagious…” it reflects very poorly on you as a dog owner to take a contagious dog off your property. I know this is a ploy to keep other dogs away–but you are also telling people you are putting their dogs in danger of sniffing along the trail where a contagious dog was. If someone called out to me they had a contagious dog on the trail where I walk my dog, I’d call the dog warden and report them. Hi, Kris. Understandable. However, if the person is allowing their dog off-leash in a leashed zoned area, I would happily accept the dog warden coming and helping. If I was forced to call out “my dog is contagious” in a leashed zoned trail, it would be extremely convenient if the off-leash dog owner did cause me to receive a visit from the dog warden. They would have provided the contact information for me to report them. Another great point! Thanks, Michelle. My little Shih Tzu was attacked by a large off lease dog. We came out of the woods around a corner and she was grabbed up by the large dog. The dog started aggressively shaking her from side to side. I’m screaming for someone to get their dog! I look and see a woman leashing another same breed large dog. After she got that dog on leash she as able to make the attacking dog let go of my Emma. Emma is whining as I pick her up. I started going. I screamed why aren’t your dogs on leash? She wouldn’t answer that question. She kept asking how I was! Said her dog was just playing. I was seeing red so I grabbed up my dogs and left. We were in a large trail park with no one else around. I figured I’d better get back to my car. I wish I would have thought to take a picture. Warn others. I did go to the parks Facebook page and posted my experience. Thanks for the straightforward post. I’m still reluctant some days to take my dogs out in public areas. People can be so selfish, self absorbed. Emma was fine physically after the attack. It took her a long time before I could get her out on walks again. Thank you for sharing your story. I am so glad Emma survived. How terribly scary for you. Indeed, that people are so self absorbed. Drives me absolutely mad.